The sidewinder is a strange looking utility flashlight, the body is shaped in a rectangular form with an articulated head that can rotate, in the head we can find a white .5W white LED and three 5mm LEDs, the 3mm LEDS are red, blue and the third one can be either green or IR depending on the model. The light uses a rotating knob to select the LED to use and a switch to select the mode for the LED being used, it has 4 brightness levels 5%, 20%, 50% and 100% that can be rotated keeping the on/off button pressed. With a double click in the switch from Off a strobe function is activated. The sidewinder uses two AA batteries and the runtime on maximum brightness is 7 hours for the white led, 10 for the green, 12 for blue and 14 for the red one. In minimum brightness it can go for over 100 hours. The white high mode is about 20 lumen. The beam of the white led is a floody warm white excellent for a tasklight, the color leds have artifacts. We liked the user interface and the ability to use 4 levels or a strobe on the 4 LED colors. The body made of polycarbonate plastic is extremely strong featuring a very good clip at the back. The head can be rotated 180 degrees to point where you want if you use the light attached to a vest or pack. We found the rectangular body very compact and useful for pockets, straps and even belt carry and the light is strongly built and very useful as a tasklight or utility light. 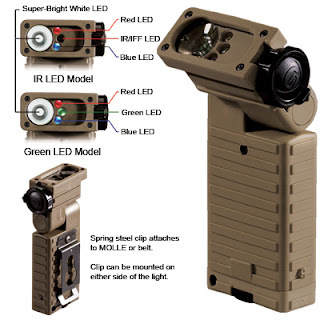 You can read more from Streamlight's website or order for $50 from BrightGuy, available in coyote tan and olive green bodies with blue-red-IR or blue-red-green leds. 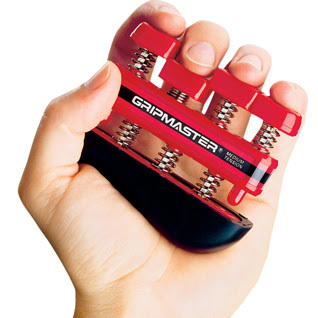 The Gripmaster is a small device to train the muscles in your hand and forearm increasing your strength and dexterity. The device has individual springs for each of the four fingers in your hand excluding your thumb, since each finger is related to its own set of muscles and tendons the Grimaster ensures that all, or most of your muscles are trained. The strength of each finger or the whole device can't be adjusted so the Gripmaster is sold in three versions offering different tensions, blue is the lightest, red medium and black the strongest. After using the gripmaster for a while you will quickly notice a burn in your hand and forearm that means that your muscles are working, the less used to work the muscle is the sooner it will burn so with time you will be able to train for longer periods and evenatually increase your hand strength, this can be useful in several activities from sports such as golf or rock climbing to tennis and martial arts. We found the device good to relax and discharge stress and it definitively works with your hand and arm muscles, the thumb not being used is a question mark about how the real improvementin your grip and a second criticism is that it is certainly boring to use it. You can read more at the Official site and order for $14 from Brigade Quatermasters.